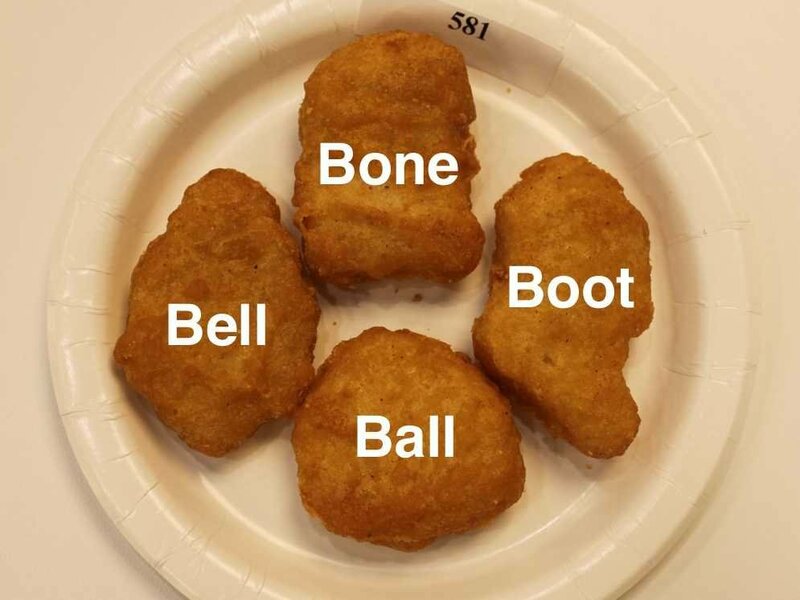 [...] Chicken McNuggets have four distinct shapes and in order to have a chance to meet the McDonald's "Gold Standard" for quality, they have to match them as perfectly as possible. And each of those shapes has its own name. But the perfect McNugget needs a lot more than a well-aligned shape, according to McDonald's standards. The company tests flavor, breading texture, meat texture, bite firmness, color, coating, and a whole lot more. It's a strangely thorough process. Chicken (45%), Coating [Vegetable Oil (Rapeseed, Sunflower), Wheat Flour, Water (8%), Maize Flour, Modified Starch, Raising Agents (Disodium Diphosphate, Sodium Bicarbonate), Whey Powder (from Milk), Flavour Enhancer (Potassium Chloride), Egg Albumen (Free Range Egg), Ground Pepper, Breadcrumb (Wheat Flour, Salt), Salt, Dextrose, Ground Celery], Water (7%), Potato Starch, Vegetable Oil (Rapeseed, Sunflower), Natural Flavouring (from Free Range Egg), Flavour Enhancer (Potassium Chloride). I'm not surprised they have so many other "standards" they have to meet with all those ingredients. Pity one of those standards isn't actually to live up to the product name. No, not the "nuggets" part (which part of the chicken is the nugget? ;-) ) but the part about the chicken: LESS than HALF of each nugget is actually chicken!!! Can McDonalds really call it a CHICKEN McNugget? Surely it should be called a Chicken-flavoured McNugget with such a low quantity of chicken.